Electro plated nickel silver lid for a condiment jar used in a Royal Air Force mess. 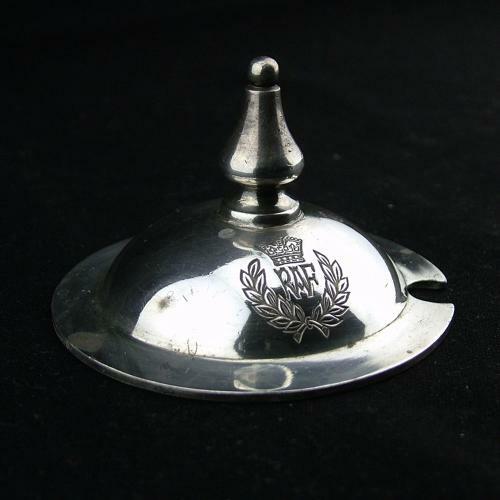 This domed silver plated lid is approximately 7cm in diameter and has a pear shaped finnial as a handle. Small cut out in the edge to allow for a small spoon handle. Deeply engraved King's crown RAF crest. This would have been used with a cut glass jar containing mustard or other condiment. Some tarnishing but will no doubt polish up well if desired. Very good used condition. Stock code M22596.